Is Muriel Spark too funny to get the respect she’s due? My mystification that Muriel Spark isn’t more widely read has continued to grow, but last week her editor, New Directions publisher Barbara Epler, offered a theory in email that echoes what Howard Jacobson has said about the devaluation of comedy in literature. Spark really is hilarious, and her humor, like Twain’s, is the kind that doesn’t date. As my (new, thanks to Jessa) friend Elizabeth Bachner observed after I pressed Memento Mori on her as she headed to the train last week, she’s also incredibly sly. Spark returned Epler’s admiration, praising her “wisdom, charm, humour and intuition, [which] must be the envy of every author.” And reading Epler’s remarks on editing, it’s easy to see that she and Spark, who resisted all but the smartest and most intuitive edits, would have had a natural affinity. New Directions has just republished Spark’s Not to Disturb, and will soon bring out her charming, idiosyncratic, stripped-down autobiography, Curriculum Vitae, which serves as a kind of preemptive corrective to Martin Stannard’s sprawling biography. My personal Spark hierarchy starts like this: Memento Mori, The Prime of Miss Jean Brodie, The Girls of Slender Means, Curriculum Vitae, but I basically recommend her whole library (apart from a few of the early stories, and even those are worth reading just to see her storytelling talents ramping up). 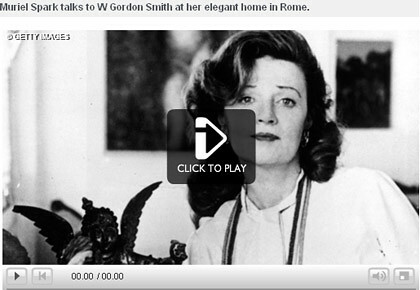 Click through to the BBC website from the image at the top of this post to watch Spark being interviewed in her Rome apartment. See also Why Muriel Spark switched publishers, Brock Clarke on Muriel Spark’s genuine artifice, the Spark riffs in my Paris Review Daily diary, and her handwritten diary entry from Rome and more of the scraps of paper she kept.